Using tensioned panels of stainless steel and thin-film photovoltaic cells, Pvilion Solar gives solar electric car charging a bit of bling. 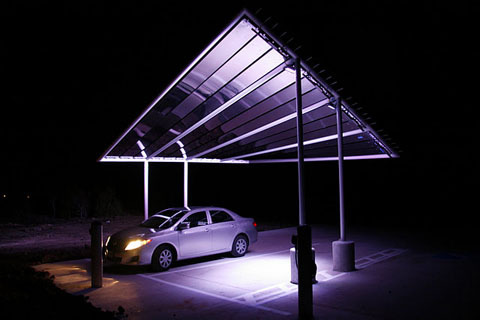 Pvilion Solar Sail canopy, near Pflugerville, Texas, also uses lights to enhance the attractiveness of the electric car charging canopy. Most solar canopies are functional, but aesthetically mundane. A collection of rigid solar panels are mounted atop a steel frame and tilted towards the south. They work. they just aren't all that attractive. That's why we decided to talk with Colin Touhey and his partners, Todd Dalland and Robert Lerner from their offices in midtown Manhattan. As the photograph of their first installation, this on at a newly developed industrial park in Pflugerville, Texas, demonstrates that it's possible to turn mundane into magic. Using their experience in developing cloth canopies for outdoor venues large and small, the trio, developed patent-pending technology that bonds thin-film solar to sheets of stainless steel, then to mount them in what they call a Solar Sail configuration under tension. This allows them to be both flexible and strong. The Solar Sail is engineered for snow and wind loads. While its design office is located on West 36th in Manhattan, the fabricated their prototypes and the final version installed near Austin, Texas, at the former Brooklyn Navy Yard, which is being repurposed for small business incubation, with the focus now being placed on recruiting and encouraging green tech businesses like Pvilion. In this 20-minute video, the three partners talk about the company and its technology. The Pflugerville installation generates 1,800 watts and is grid-tied. The two chargers are Coulomb units and provide both AC Level 1 and 2. Touhey quoted a price of $50,000 to $95,000 depending on configuration. You can learn more on their Tumblr web site at http://pvilionsolar.tumblr.com/. To listen to interview, click the embedded MP3 players in the right hand column, or download the file to your hard drive for playback on your favorite MP3 device.